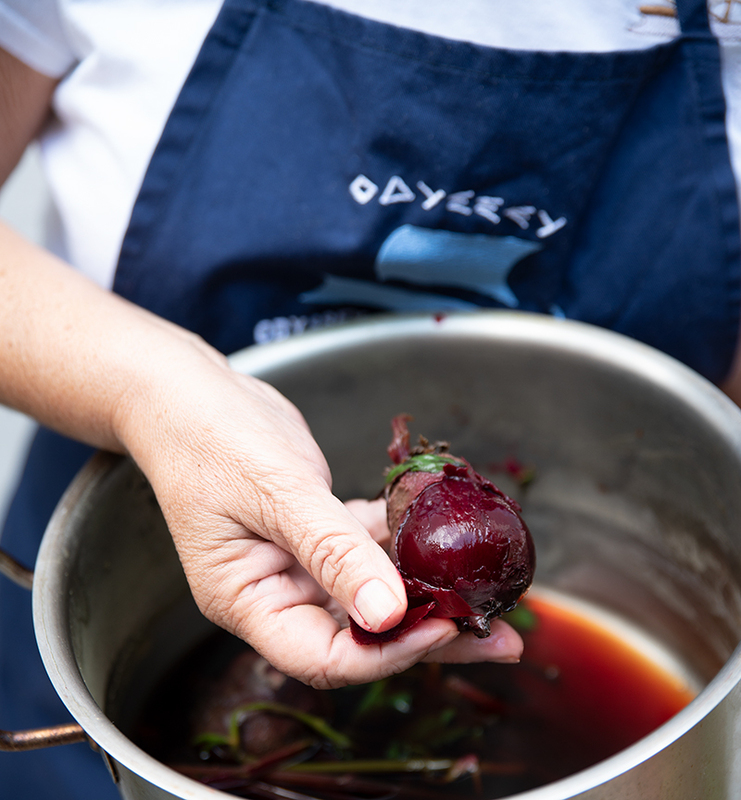 Make Odyssey's Beetroot Soup for Christmas, your guests will love it! 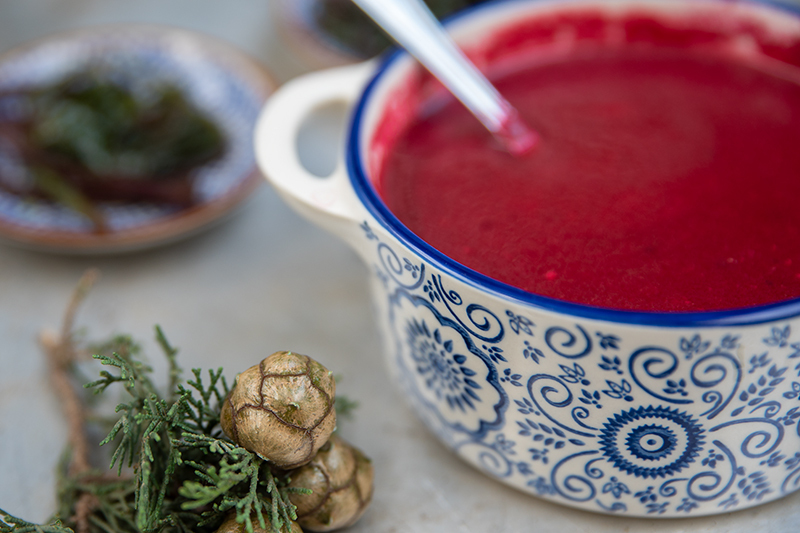 For Christmas I have created a lovely, super tasty and easy to make beetroot soup. You only need a few ingredients, but it looks so glamorous that you can pretend that you spent weeks in the kitchen to get it so good (my favourite pretense). Not only can you use the beetroot soup for your Christmas dinner (when pretense of exhaustion from hard cooking is necessary), but of course also to enjoy in between all the busy hours of the day. You are going to love it! In Greece we buy beetroots with the leaves on. We use the roots for the soup and the boiled leaves we eat with fresh olive oil as a salad. You might find them served like that in some tavernas in Greece. For sure that is how we usually eat them at home. The boiled beetroot leaves go very well with the Skordalia garlic dip that was on my blog before. 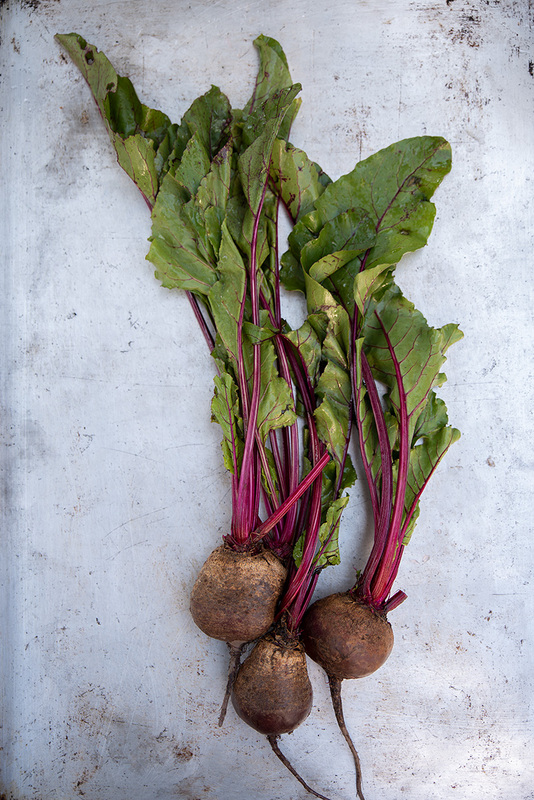 The humble beetroot straight from the soil has to me the nicest earthy taste. With some Greek yoghurt to lighten it up and the light bitterness of the fresh oregano, it makes a divine soup. Beetroot was in the classical years mainly used for medicinal purposes, and not so much as a food; that started much later. But the beetroot being so useful, there are a few stories about it. Here is a nice and simple one that I love! I found it on the website www.wattsenglish.com. Once upon a time there was a little house where an old man and woman lived with their little granddaughter. Everyone called the old man Granddad, and everyone called to old woman Grandma. One day Granddad decided to plant some beetroot. He went to the field and planted a beetroot seed. The beetroot soon started to grow. It grew and grew and grew until it was big – very big. When Granddad saw it, he started wondering what he would do with it. He thought of pulling it out of the ground. But when he tried he found he couldn’t do it, it was too big. So he called Grandma and she came to help. She grabbed hold of Granddad, and Granddad grabbed hold of the beetroot, they pulled, and pulled, and pulled but they still couldn’t pull the beetroot out of the ground. So Grandma called to her granddaughter to come and help them. The granddaughter grabbed hold of Grandma, Grandma grabbed hold of Granddad, and Granddad grabbed hold of the beetroot. They all pulled, and pulled, and pulled but they still couldn’t pull the beetroot out of the ground. So the granddaughter called to her dog to come and help. The dog grabbed hold of the granddaughter, the granddaughter grabbed hold of Grandma, Grandma grabbed hold of Granddad, and Granddad grabbed hold of the beetroot. They all pulled, and pulled, and pulled but they still couldn’t pull the beetroot out of the ground. So the dog called a cat to come and help. The cat grabbed hold of the dog, the dog grabbed hold of the granddaughter, the granddaughter grabbed hold of Grandma, Grandma grabbed hold of Granddad, Granddad grabbed hold of the beetroot. They all pulled, and pulled, and pulled but they still couldn’t pull the beetroot out of the ground. What now? There was no one else to help them. Just then a small mouse passing by and saw them all trying to pull the beetroot out of the ground and decided to help. The mouse grabbed hold of the cat, the cat grabbed hold of the dog, the dog grabbed hold of the granddaughter, the granddaughter grabbed hold of Grandma, Grandma grabbed hold of Granddad, Granddad grabbed hold of the beetroot. So they all pulled, and pulled and pulled. Heave-ho! The beetroot came out! When they all worked together, they were able to pull such a big beetroot out of the ground! That ́s the end of the story about the big beetroot. I wish you many friends in your life who will help you to dig up your ‘beetroots’ (whatever beetroots they might be) and I hope that you will have all of them around you for Christmas and New Year! 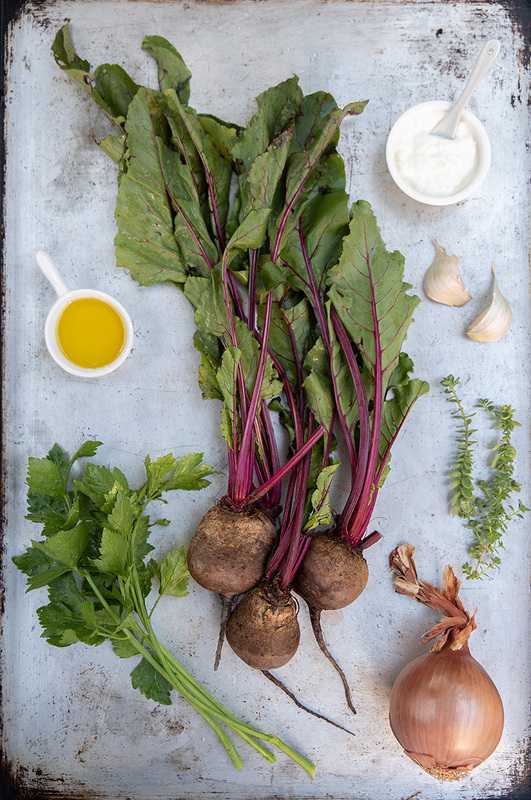 We start by gathering the ingredients: olive oil, an onion, celery sticks, garlic cloves, water and of course the beetroot! Have salt and ground black pepper ready. Boil the beetroots and the leaves. Once they are tender, take them out of the hot water and let them cool or rinse them with cold water. When the roots are cooled down, peel the skin of the roots with your hands. This is a very easy process, but your hands will get red! Sweat the onion, add to it the beetroot, celery, garlic and the water and simmer it gently for 7-10 minutes. Once cooled, purée it with a hand-held blender until smooth. Taste, season with salt and freshly ground black pepper and set aside to cool until just warm. 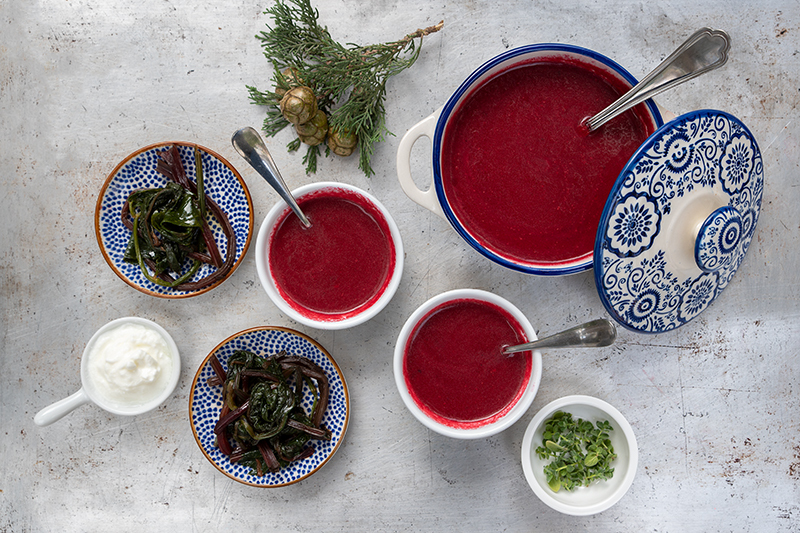 Look at this beautiful beetroot soup; don’t you love the colour? You can top it with dollops of Greek yoghurt and fresh oregano. Merry Christmas!! Boil approximately 2 litres of water in a big pan. Cut the beetroot leaves and place the roots in the pan with the boiling water. Let it boil for approximately 20 minutes. 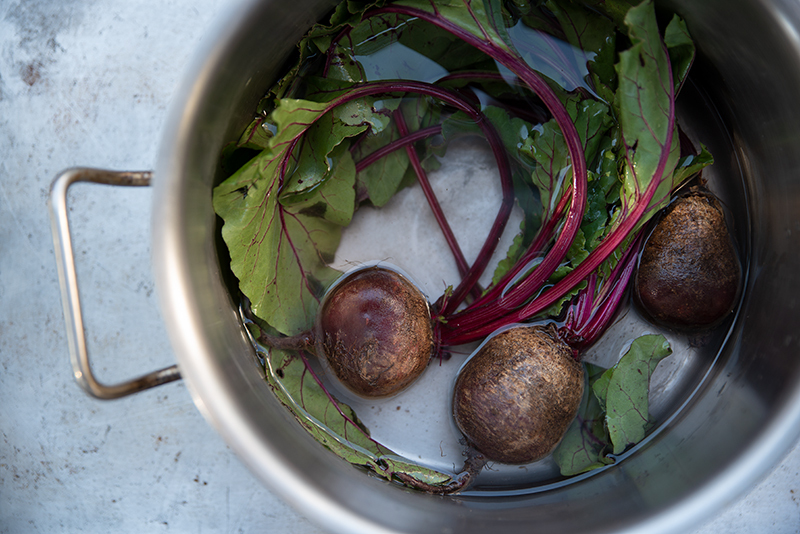 Add the leaves to the pan with the beetroots and let it all boil for another 10 minutes. Test the roots with your fork. Once they are tender, take them out of the hot water and let them cool or rinse them with cold water. If you want, you can re-use this water they have boiled in to add it to the soup later on. When the roots are cooled down, peel the skin of the roots with your hands. This is a very easy process, but your hands will get red. You can either wear gloves or just wash your hands after you finish. The red will not stay on for too long. Heat the oil in a pan and sweat the onion for a few minutes until soft. Add the beetroot, celery, garlic and the water and bring to the boil. Simmer gently for 7-10 minutes. Cool slightly, then purée with a hand-held blender until smooth. Taste and season with salt and freshly ground black pepper. Set aside to cool until just warm. Divide the soup between bowls and top with dollops of Greek yoghurt and fresh oregano. Hi Katerina! This sounds so yummy! I see you show only celery leaves in the picture. Here in the US our celery comes in stalks, comprised of 10-15 ribs per stalk & with leaves just at the top. So I’m wondering about quantity….I’m going to try this recipe using 2 ribs of celery & see how the flavor is & how the ribs purée. Maybe it’s only a difference in terms! Warmest wished for the holidays & 3 Kings’ Day!